The white teeth are the sign of attraction on your face. Teeth are one the best and beautiful features of face and if they are cared properly, you will be attracted in front of others because when you meet to someone, you intentionally give smile and your teeth appear in front of him. Those people who have the poor color of their teeth or yellow teeth avoid smiling in the public due to having an unconfident situation. There are some circumstances behind having the yellow teeth; it may be due to the aging, hereditary factors, poor dental hygiene, excessive consumption of tea, coffee, tobacco and cigarettes. These are the common reasons. Sometimes deficiency of calcium, improper intake of water and metabolism, use of medicines or antibiotics, climatic conditions can also be the reasons of discoloring of teeth. 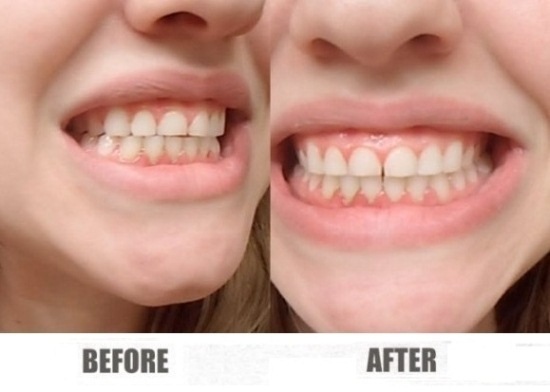 So do not go here and there in search of professional treatment for removing the yellow teeth because these treatments are very expensive and do not give as such results in the minimum period of time. If you want a rapid solution of getting rid from yellow teeth to turn them into the white color so start treating your teeth with the help of home remedies that can be made from most of the kitchen ingredients that can be easily available to you. Now restore your pearly white smile with confidence. Baking soda is an amazing ingredient to use for treating the yellow teeth. It will make your teeth as shiny as the stars. Take a little amount of toothpaste and mix with a quarter tsp of baking soda. Use this mixture to brush your teeth daily then rinse your mouth with warm water. Alternatively lemon juice is an excellent ingredient for the yellow teeth. Combine lemon juice, white vinegar, baking soda and mix them well together then brush your teeth with this mixture at least twice a week. Now you can easily make a whitening mouthwash at your home. Mix one tbsp. of baking soda and half tsp of hydrogen peroxide. Add one cup of cold water in this mixture. Rinse your mouth with this homemade mouthwash regularly two to three times a day. Orange peel is another great thing through which you can make your teeth shiny and pearly white. Orange peel helps in reducing the yellowness and brown patches accumulated on your teeth. Orange peel contains vitamin C and calcium that fight against the microorganisms present in your mouth. Rub the orange peel on your teeth directly at every night before going to bed. Do this remedy for some weeks to see the better result. Vitamin C is very important for the beautiful teeth. Vitamin C is present in many fruits so in strawberries which helps to make your teeth whiter. Take some strawberries and grind them until it becomes in a form of paste. Rub the paste on your teeth with the help of your fingertip gently. 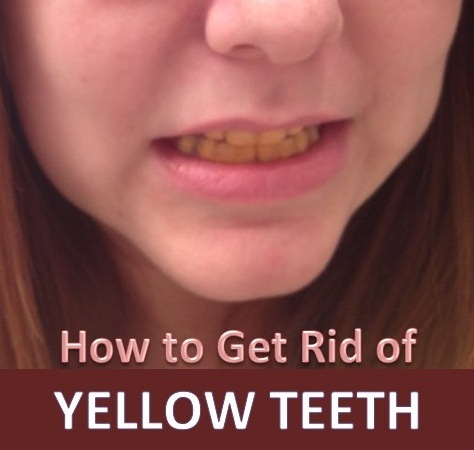 This remedy should be done twice a day to reduce the yellowness of teeth in just a fewer time. You can also mix some baking soda in the pulp of strawberries then spread the mixture on your teeth. Leave it for the five to ten minutes. Rinse out your mouth then brush your teeth with the toothpaste to reduce any particles. Hydrogen peroxide is a bleaching agent so using this can help in turning the yellow color of your teeth into the shiny white. Always choose the mouthwash containing hydrogen peroxide. Cleanse your mouth with this mouthwash regularly. Make toothpaste by adding baking soda and hydrogen peroxide together in the equal quantities. Brush your teeth daily with this toothpaste. The lemon is also known as the bleaching agent and it greatly effects the yellow discoloration of your teeth to turn into white. Try to make your habit of rinsing your mouth with the fresh lemon juice. Scrub your teeth with the lemon peel. Mix few drops of lemon juice with some salt. Rub this all over your teeth and gums with the gentle movement of your fingertip. Leave it for about ten minutes. Rinse it thoroughly with warm water. Do this remedy two or three times daily. Salt is used as the cleansing agent for treating the yellow teeth. The lost mineral contents in the teeth can be growing again by the help of salt. Use salt as a tooth powder regularly in each morning. You also have an option of mixing common salt with charcoal. Brush your teeth with it daily. Holy basil commonly known as "tulsi or niyazbu ke patty" is a kind of herb and its leaves contain the whitening properties. They also protect your teeth from any trouble like pyorrhea, and advanced form of periodontal disease. Take few holy basil leaves and put these in the sunlight for few hours. When the leaves get dry, grind them until it becomes in a powdered form. Mix the powder with the toothpaste that you use regularly. Now brush your teeth properly. Alternatively, make a paste of holy basil leaves and mustard oil then use it for the cleaning purpose of yellow teeth for turning them into white. "An apple a day keeps the doctor away". As we know that apple can take care ourselves and fulfill the vitamins in our body. Eat a crunchy apple daily because it can be used as a scrub for your teeth. Eat at least one or two apples daily to get rid of yellowish teeth. The apple is acidic in nature so chewing it can help in reaching the fiber-rich contents of apple to the teeth for working. You can also eat raw carrots, cucumbers and broccoli. Charcoal is the most amazing home remedy for making the teeth whitish in color. Charcoal has the crystal-based chemical present in it which gradually helps in making your teeth as white as pearl. Add some charcoal powder in your regular toothpaste. Do this remedy twice a day to get instant result of the sparkling teeth. Margosa is also recognized as neem. Margosa is also used to treat the yellow teeth. Margosa contains the astringent and antiseptic properties. It helps to prevent from the bad breath dental cavities. Margosa twigs are easily available at the stores so you can use that twig as your toothbrush. Chewing the branches of Margosa also helps to make your teeth white and shiny. You can mix Margosa oil with your toothpaste to brush your teeth regularly.